I remember back in the 90’s, teppanyaki was a bit of a novelty. Back then, it was very much theatrical with the chefs throwing eggs at you with a bowl on your lap. Much fun and occasionally messy. That trend lasted a few years. Over the years, Japanese food has had some sort of ascendency around the world. Back 15 to 20 years ago, only very few non-Japanese people would eat raw fish!!!! And on top of that you add hot wasabi (or horseradish pretending to be wasabi) with a dash of soy. Nowadays, Japanese is very much in style. Just last year, I remember seeing an article in the New York Times food section about making sushi fun with kids. 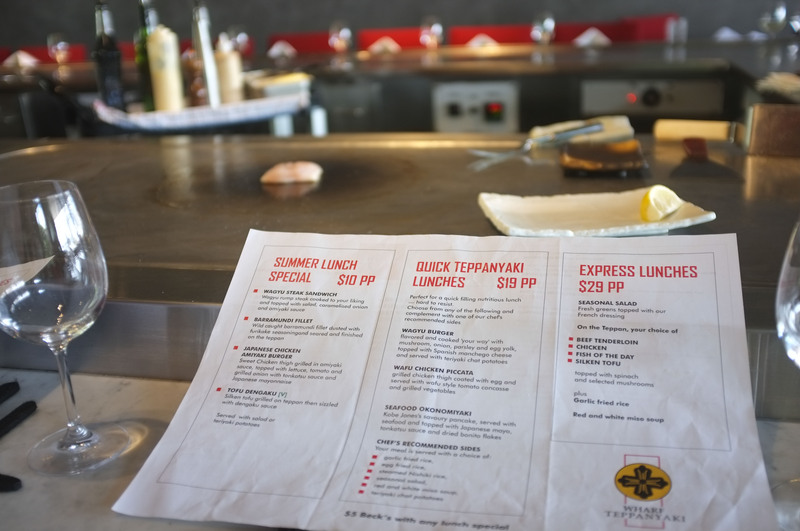 Teppanyaki is now more refined and subdued. Kobe Jones (this one is the King St Wharf branch) has added a teppanyaki section and for lunch (I think Sunday as well), you will only have to pay $10 for a quick meal.